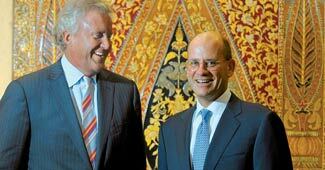 General Electric adds booster fuel to an aggressive India strategy with new ideas and a new structure. Senior citizens can use their homes to fund their retirement years through the reverse mortgage scheme. Ever since the liberalisation of 1991, and especially over the past decade, many big Indian groups have made big-ticket acquisitions abroad in diverse sectors. Jeff Immelt stepped into Jack Welch's shoes four days before 9/11. Even more than the legendary Welch, he has GE blood in his veins - his father worked for the company and he met his wife at the company. Hamish McDonald's latest book on the Ambanis is engrossing fare but, at the core, it is an updated version of the banned 'The Polyester Prince', says Rishi Joshi. Coming soon to a showroom near you. "I Will Lead Till I'm 100"
The Vodafone decision, as expected, was appealed to the SC where the Attorney General reportedly wanted Vodafone to deposit 50 per cent of the tax demand of Rs 12,000 crore. Retail and FMCG join the hiring rush, as ITES slips, reveals a BT-TeamLease survey. The former film giant reinvents itself. How Research In Motion plans to change the image of its devices. In the latest Rajinikanth flick Robot, the Tamil superstar plays an Android robot called Chitti which looks, walks and talks like a human being. "Consolidation is imminent in life insurance"
"B-School curricula big on India, China"